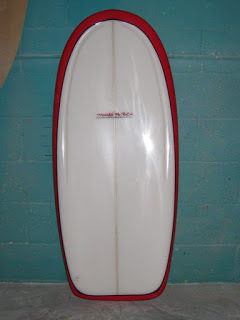 This twin-fin T-Belly is headed for Nor Cal. It was just polished out yesterday, so I thought I’s take some good pix before it heads up there. The T-bellys have a number of unique features. The deck has a 1/4″ concave starting about the mid-point and deepening towards the tail. Thickness along the stringer is 2-1/2″ while thickness at the rail is 2-3/4″. The concave offers a snug fit for the rider. The bottom also has a beveled rail in the rear half of the board the facilitates rolling the board over on the rail to turn. With less than 1″ tail rocker, the bevel offers an additional 3/8″ of rocker at the rail. The bottom is relatively flat in the middle transitioning to slight convex or “belly” in the nose. I don’t like the look of handles or straps on the deck, but realize that there is a need for grip enhancement. Taking a cue from shortboards built for doing aerials, I add “thumb grooves” to the front-half of the T-Belly for better grip.